Mornings are my favorite time of day. I love the way the sunrise greets me by peaking through my bedroom window, the quiet stillness around me before I am forced to go at “full speed”, and the general sense of hopeful optimism that comes with the start of each day. Needless to say, I am somewhat of an early riser, I give myself plenty of time at the start of each day to get prepared for the world, prepared for real life. If you do what you love each morning, if you do what makes you feel good, I believe, it will put you in the right mindset to face the rest of your day, whatever is on your “plate” at the moment. My morning ritual consists of a large cup of coffee, great music, a cozy robe, my favorite scented candle, some Pinterest time (perusing some inspiring images and quotes), possibly a walk/jog, and a large homemade breakfast that will both nourish me and allow me to exercise some creativity. Most mornings I make the same thing but occasionally I get inspired to do something different, just depends on what’s in my refrigerator or pantry. My most recent breakfast treat is completely Fall inspired, pumpkin waffles. What makes them even better is that they are vegan, dairy-free and gluten-free. It’s dairy-free because I use almond milk instead of regular milk and coconut oil instead of butter. It’s vegan because there is no dairy or eggs. Why no eggs? Well, first because when I was making these waffles I didn’t have any at the time and second, because I was making SUCH a small batch (how do you reduce a recipe that serves four but only uses one egg?). The reason it’s gluten-free is because I had some left over gluten-free all purpose flour. For all you skeptics out there that are lucky enough to not have any food allergies/sensitivities the answer is yes, yes they taste absolutely delicious. I’m also willing to bet that if I didn’t tell you that they were vegan, dairy-free or gluten-free you would not have been able to tell. 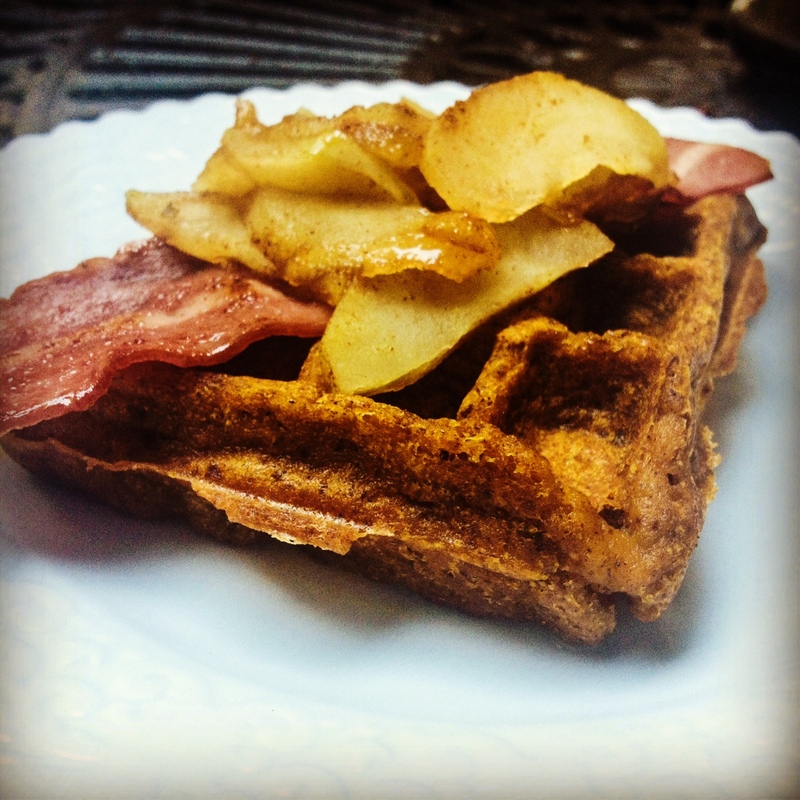 🙂 I topped my waffles off with some not-so-vegan crispy turkey bacon and warmed cinnamon spiced apples. YUM!